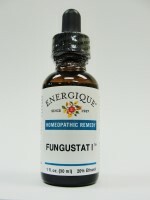 FUNGUSTAT I is a homeopathic remedy that supports your body in the detoxification of various molds and fungi (aspergili). It provides temporary relief from heartburn and distention, burning on urination, flatulence, and apathy; and improves digestion issues associated with fungal conditions. Tabebuia impetiginosa 3x, Echinacea angustifolia 3x, Sepia succus 12x, Nux vomica 12x, Abies nigra 12x, Lycopodium clavatum 12x, Pulsatilla nigricans 12x, phosphorus 12x, Skatolum 15x, Candida albicans 30x and distilled water. 20% ethanol.